Calxa provides the choice between a local database and network database types. If you are using a local database but would like to access your data from different locations, then you could use cloud storage applications such as Dropbox, OneDrive, Google Drive or many other alternatives to synchronise your Calxa database across multiple machines. Please note that this is not an alternative to a network database that would provide concurrent multi-user access. Read this help note for help on choosing an appropriate data source to use. As an example, this workaround is ideal if you access a local Calxa database at work and need to access the same database at home. Install Cloud Storage/Syncing software of your choice. Make sure your synchronised folder is on a local hard disk as this is a requirement of the Calxa local database. Please refer to vendor specific support material, however in most cases it is also recommend this is on the same hard disk as your operating system. Open existing Calxa database from your synchronised folder First you will need to download and install the cloud storage/syncing tool of your choice. For the remainder of this article we will use Dropbox. We will be doing this in Windows Explorer so first you need to locate where your existing Calxa database is saved. Browse to this location using Windows Explorer and copy your Calxa database to your new synchronised folder. In the example above this is the file named Default.CalxaDB and you can see it is saved in the Calxa folder inside Aaron’s Documents library folder. Now you want to move this file from this location to the new synchronised folder. For example if Aaron had now installed Dropbox with the default settings, he would move the “Default.CalxaDB” file to the folder “C:\Users\<username>\Dropbox”. As long as Calxa is not currently open you can simply double click on the database file in Windows Explorer, otherwise follow the steps below to open a Calxa database from the Calxa Create or Open screen. 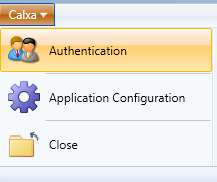 Open Calxa and select Authentication from the Calxa menu in the upper left corner. 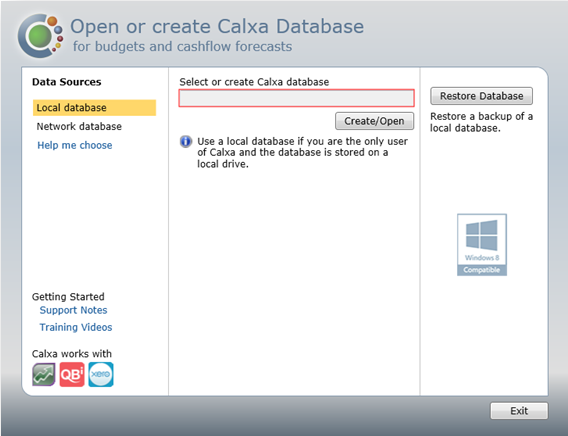 On the Open or create Calxa Database screen, select Local database from the Data Sources column. Click the Create/Open button and browse to your synchronised folder location. Select the Calxa database and click Open.